Wash and dry each apple well and spear each one with a fork. Place the peanut butter into a very small bowl. Then, warm the date syrup in another tiny bowl in the microwave for about 15-20 seconds so it's thin and runny. Mix it into the peanut butter. 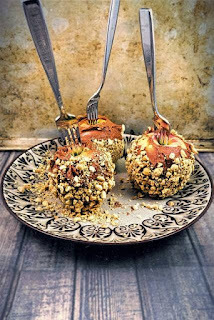 Hold a fork-speared apple, and gently spread the peanut butter mixture on it in, then roll in chopped peanuts.